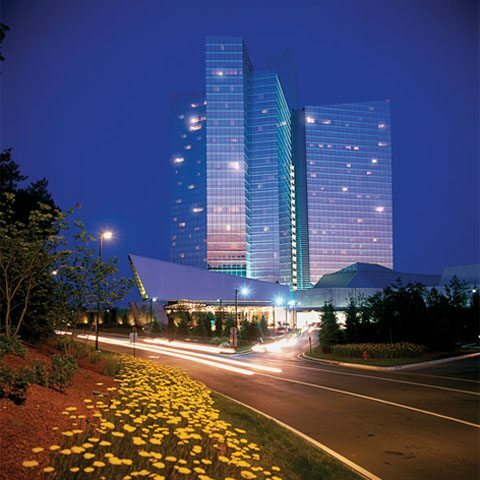 The Mohegan Sun offers stunning architectural elements in this luxury hotel. Standing 34-stories tall with 1,200 luxury guest rooms and suites, the Mohegan Sun has been expertly designed to set a new standard of excellence. Measuring a minimum of 450 square feet, each room contains either a king or two queen beds, relaxing lounge chairs and spacious marble bathrooms. The hotel has an impressive 7-story indoor waterfall. The world’s largest and most spectacular Planetarium dome and breathtaking Wombi Rock, a glowing crystal, mountain made of imported stone. Situated on 240 acres along the Thames River. A leisurely treat for our hotel guests, the 10,000 square-foot solarium with an indoor/outdoor pool and whirlpool are the perfect way to unwind. In the summer months, sunbathe or just relax in the summer heat on the 17,500 square-foot sun terrace located just beyond the pool area and enjoy our nightly fire pit featured throughout the summer, weather permitting. Three of the world’s most amazing casinos, Casino of the Earth, Casino of the Sky and Casino of the Wind are just steps away. There are more than 5,000 slot machines and over 300 table games, including favorites like Blackjack, Roulette, Baccarat, Craps and Pai Gow, Poker, and state-of-the-art Race Book. New to gaming or a particular game? Dealers and staff are always ready and willing to offer advice and teach you how the game is played.